There was. And it wasn’t the last. Initially there was a bit of confusion over the tyre size we actually wanted so they hadn’t been ordered. They would come the next day, for sure. 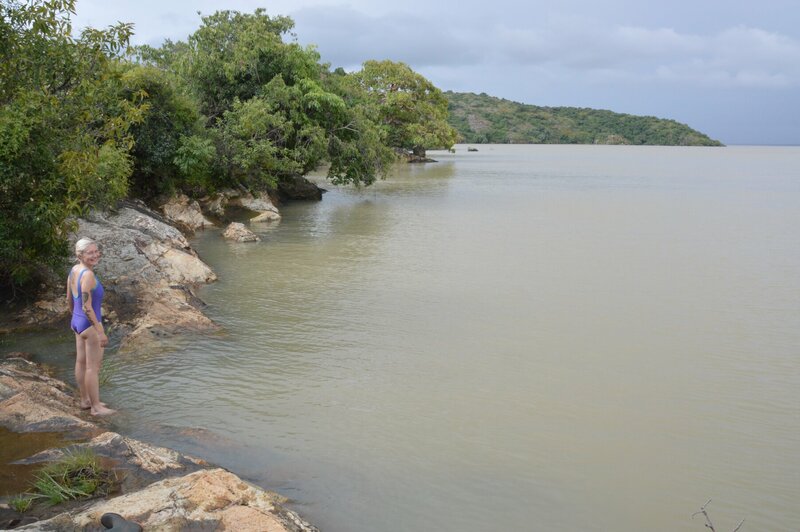 So we headed South West to Lake Tana to stay by the lake at Tim and Kim Village. This trip was an adventure in itself in the rainy season since the usually good dirt road is in the process of being paved, which for now means a series of mud holes, water features and one river crossing where a bridge is out spice up the experience. We actually met Tim on the way, heading in the other direction taking a lift out on a truck, and it was he who warned us of the ‘tricky bits’ and river crossing. Troopy coped well though and we waded the fast flowing muddy river, water lapping at the doors, with ease and a cheer from the local stranded bus passengers (some of whom were wading it themselves, with less ease and comfort). There was, however, one unknown little issue the river crossing caused which would only come to light in the distant heat of the Danakil Depression days later. Kim and Tim’s was the nicest place we’d stayed in a while, with a chance to swim in the lightly cloudy lake waters (the Hippos don’t come near the swimming spot, apparently), and relax over a beer in the comfortable, open sided thatched building that provides lounge, bar and restaurant. 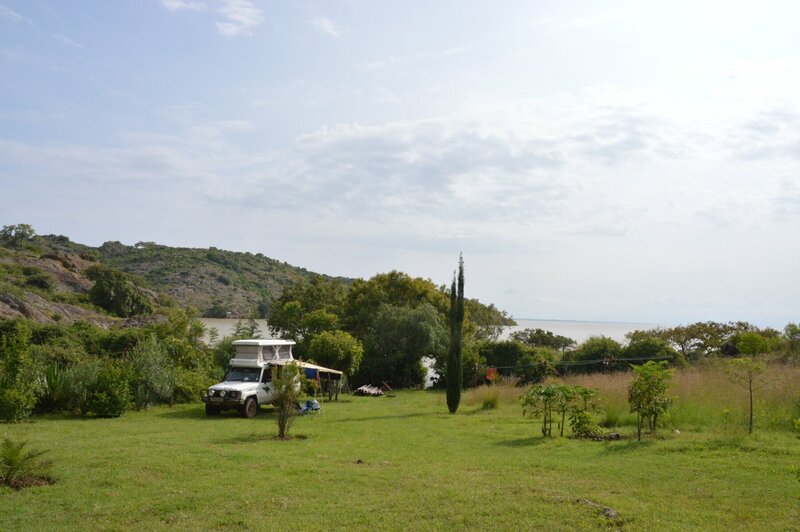 Kim chatted to us about how they came to set up this lovely village style hotel and campsite, running it as a project to train local people in good tourism, while baboons in a tree up the hill tried to express their opinion too. We were shown around by a young lad whose friendly charm, manner and and excellent English were a credit to the project. Later we were treated to a fresh and tasty specially made vegan meal before retiring to Troopy for the night a few metres from the lake. The mosquitoes weren’t even too bad here! Next morning’s return trek through a slightly lower river, but no less mud, had us back in Gonder waiting outside the tyre guy’s place just after lunch. Then quite a lot after lunch some people turned up and we waited as the tyres were ‘on the way’. Sometime around 4pm, after a comical but effective Troopy-wash was carried out by an assorted gang of ‘helpers’ and hangers on to pass the time, the tyres turned up in a tuk-tuk! Sadly, they were totally different to the ones we ordered – Bridgestone Mud-Terrain and no doubt cheaper than the BF Goodrich All-Terrain we had paid for. A heated exchange ended with us getting our money back and leaving town for what we hoped, but daren’t assume, was the last time. Driving at night in Ethiopia is not for the faint hearted. Actually nor is driving during the day, but at least during the day you can see the people and animals that wander down and across the road wherever you are, and avoiding the random giant holes that appear irregularly in otherwise good road surfaces is sometimes possible. Driving at night actually seems to improve other vehicles behaviour, or perhaps the dark just hides the usual horror? Anyway, after some good distance during the evening we continued towards Lalibela in the dark and occasional rain until hunger overcame us and my nerve gave out. Nerve was not helped by having to make a tyre-squealing brake and swerve manouvre on a long descent to thread between a herd of cattle hidden by oncoming truck headlights, missing cows by inches on either side. 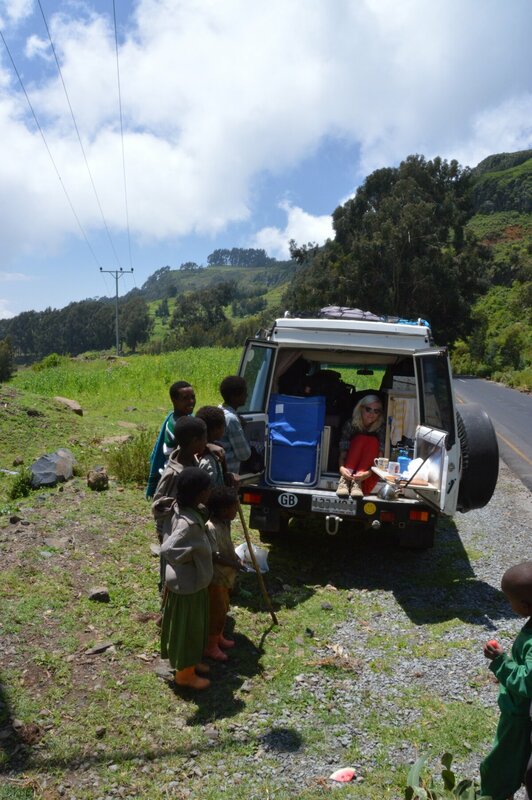 We pulled into a mountain lay-by aiming to camp behind some trees hidden from the road. This plan was scuppered within 5 minutes (and a few mossie bites), when a passing truck stopped to offload a couple of heavily-armed police officers who told us to move on as it is dangerous to camp in the mountains. Reluctantly we resigned ourselves to a night in another no-doubt-grubby hotel, but were surprised to find a cheap but nice and clean hotel with secure parking in the next town. The rude and incompetent staff were the issue in this place though, and the less said about porridge-with-crushed-raw-garlic the better! On the other hand they failed to charge us for dinner, despite attempts to correct them, so it balanced out I guess. In the morning we headed to Lalibela – the UNESCO World Heritage site of 11 rock-hewn churches, cut down into and carved out of solid, gently sloping rock. The journey there was a pleasant wander, firstly on paved roads and then some 60km of secondary gravel, variously eroded by this rainy season. The children appear from nowhere, everywhere. We stopped for snacks and lunch, and climbed the long, steep mountain into the town for early evening. After confusing ourselves and google maps on the tightly convoluted hairpins and mud-hole roads we checked into the Seven Olives Hotel, recommended in our old guide book for its good food. Dinner alone justified this decision as there was plenty of vegan choice again and it was superbly cooked and presented – Katana will be bringing you a post covering Ethiopian Food shortly, so you can read up on the details soon! We spent the next morning (and $50USD each…this is A LOT of money here, but at least goes to the upkeep of the churches) exploring the 11 churches. These are some of the most important religious sites in Ethiopia, and actively used for worship at all times. Scattered in 2 main complexes plus 1 solitary church across the rugged rocky hillside and surrounded by the tatty town and muddy streets, all that can be seen at ground level are the (somewhat obtrusive) protective canopies placed over most of the sunken churches to protect them. For me, the most memorable sensory experience was the feel and sound of bells and drums reverberating through a large dark cave we had squeezed into down a steep, narrow passageway itself roughly cut deep into of the rock. Having torches was essential! 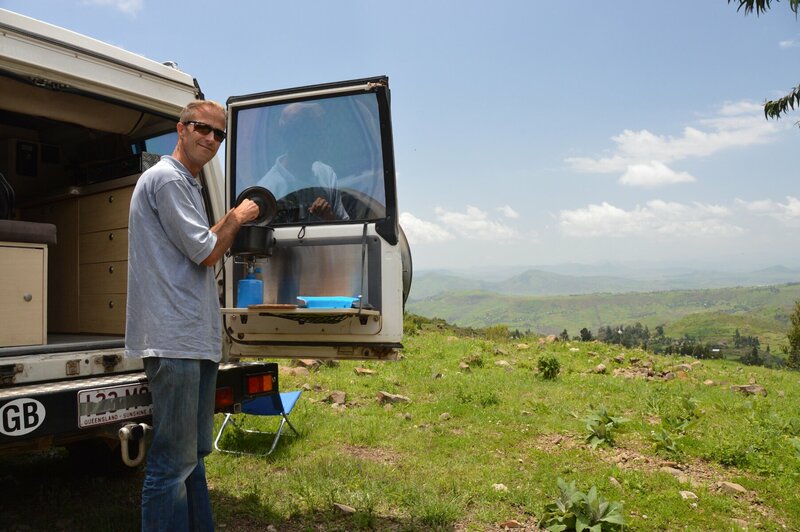 By lunchtime we were done with this cold, wet mountaintop and ready for the next bit of our journey: 300km of secondary mountain ‘road’ as we headed NE to Mekele, where we wanted to visit the Danakil Depression.